During Red Tractor week, each sector is sector is being granted its own day in the spotlight - and Wednesday is pork's day. The aim of the campaign, which is largely visible on social media, is to provide information about Red Tractor standards across the supply chain. Supplying Red Tractor with videos and images to share. NPA chief executive Zoe Davies said: “Red Tractor is an important part of the sales story behind British pork, reminding consumers of the standards that underpin it and encouraging them to support the British pig sector. Meanwhile, the NFU has welcomed commitments from Defra Secretary of State Michael Gove to publicly support the British farming sector on today’s Back British Farming Day. The NFU’s Back British Farming Day is a rallying call to encourage MPs to use their position in Westminster to support British farming, particularly in forthcoming Brexit negotiations. And during Brexit he wants Government to support farmers more than ever, not just to export to new markets but also to ensure that domestics and European markets continue to benefit from high quality British produce. 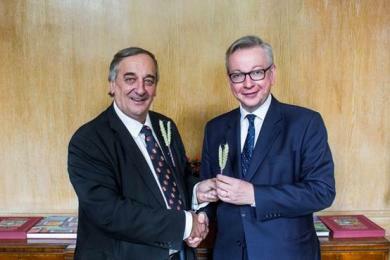 NFU President Meurig Raymond said: “We welcome the Secretary of State’s commitments ahead of Back British Farming Day. This support will be critical for the farming sector as Brexit negotiations get underway. “It’s vital the Secretary of State stays true to these commitments and encourages the wider Cabinet to champion British farming and ensures agriculture is a central part of the political conversation during Brexit negotiations. We must ensure farming in this country has a thriving future outside of the EU."